Being a client-centric organization, we are manufacturing, supplying, and exporting a wide range ofÂ Disposable Surgical Gowns. Disposable Surgical Gowns are fabricated by using high quality polymer non-woven fabric to ensure gown is light in weight. These gowns are designed to prevent the body from dust and liquid. 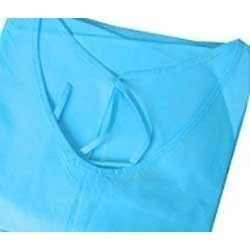 Disposable Surgical Gowns can be availed to our clients at economical prices. Size : 30 GSM, 40 GSM and 50 GSM.